Copyright © 2013 Zakaria M. Sawan. This is an open access article distributed under the Creative Commons Attribution License, which permits unrestricted use, distribution, and reproduction in any medium, provided the original work is properly cited. Seed quality is one of the most important factors for stand establishment in cotton (Gossypium Sp. ), and the use of good-quality seeds is therefore essential to obtain an optimum plant population. Conditions prevailing during seed formation can affect the quality of seed produced, and hence crop establishment in the next growing season. These conditions can affect the germination of the seeds and the ability of the seedlings to emerge from soil. Field experiments were conducted to investigate the effect of nitrogen (N), phosphorus (P), potassium (K), foliar application of zinc (Zn) and calcium (Ca), and the use of plant growth retardants (PGR) [e.g., 1, 1-dimethyl piperidinium chloride (MC); 2-chloroethyl trimethyl ammonium chloride (CC); or succinic acid 2, 2-dimethyl hydrazide (SADH)], during square initiation and boll setting stage, on growth, seed yield, seed viability, and seedling vigor of Egyptian cotton (G. barbadense). Dry matter yield, total chlorophyll concentration, K, Zn and P-uptake plant−1, were increased with the addition of K, foliar application of Zn, and different concentrations of P (576 - 1728 g·ha−1 of P). Seed yield plant−1 and plot−1, seed weight, seed viability, seedling vigor, and cool germination test performance increased as a result of the addition of the high N-rate (142.8 kg·ha−1 N), the high P-rate (74 kg·ha−1 P2O5), K (47 kg·ha−1 K), and from application of Zn, and Ca and the PGR. From the findings of the present study, band application of such treatments showed improved cotton-seed yield and affected the quality of seed produced, and hence crop establishment in the next growing season. Sowing is a critical time in the life cycle of any crop and the seeds are frequently exposed to adverse conditions that may compromise the establishment of seedlings in the field . Stand establishment of cotton seedlings is one of the most critical stages in cotton production. Cotton-seed quality is affected, to a large extent, by the indeterminate growth habit of the cotton plant, which allows seed to set and develop across an extended period of time. Seed vigor and viability are important components influencing seedling establishment, crop growth, and productivity. Any factor (biotic and/or environmental) that negatively affects seed vigor and viability during seed development will have adverse consequences on crop production, especially when seeds are sown under environmentally stressful conditions . Both size and number of seeds, produced by plants, are most likely determined by their nutritional status at the time of flowering and bud initiation. Furthermore, the most important single determinant of mineral nutrient reserves in seeds is the mineral nutrient availability to the maternal plant during reproductive development, with increasing supplies of a particular mineral nutrient enhancing the nutrient concentration in the mature seed . Plant nutrition using a balanced fertilization program with both macroand micro-nutrients has become very important in the production of high quality seed. Many management practices and breeding efforts have allocated plants to partition more carbohydrates into bolls and less into vegetative growth. Mineral nutritional status of plants has a considerable impact on partitioning of carbohydrates and dry matter between shoots and roots. Often, the number of sink organs is the yield component that is affected mostly by mineral nutrients. The positive effect of mineral nutrient supply on the number of sink organs may result not only from an increase in mineral nutrient supply, but also from an increase in photosynthate supply to the sink sites or from hormonal effects . Nitrogen (N): In cotton culture, N has the most necessary role in production inputs, which controls growth and prevents abscission of squares and bolls, essential for photosynthetic activity , and stimulates the mobilization and accumulation of metabolites in newly developed bolls, thus increasing their number and weight. With a dynamic crop like cotton, excess N serves to delay maturity, promote vegetative tendencies, and usually results in lower yields [6,7]. Therefore, errors made in N management that can impact the crop can be through either deficiencies or excesses. If an N deficiency is developing in a cotton crop, it is not particularly difficult to diagnose and correct. Excess N fertility levels, which can be damaging to final crop productivity, are subtler to detect, and are difficult to correct . Phosphorus (P) is the second most limiting nutrient in cotton production after nitrogen. Response to P fertilizer; however, it is often difficult to predict, even with soil test-based applications . The high soil pH (>7.6) and the high quantities of CaCO3 result in precipitation of P, which reduces the soluble P supply. Its deficiency tends to limit the growth of cotton plants, especially when plants are deprived of phosphorus at early stages than later stages of growth . P is also involved in cell division and development of meristematic tissues . Moreover, on a whole-plant scale, P plays a decisive role in carbon assimilate transport and metabolic regulation . Phosphorus deficiencies lead to a reduction in the rate of leaf expansion and photosynthesis per unit leaf area . Sasthri et al. found that application of 2% diammonium phosphate to cotton plants increased seed yield, seed germination, root length, vigor index and dry matter production. Potassium (K): The physiological role of K during fruit formation and maturation periods is mainly expressed in carbohydrate metabolism and translocation of metabolites from leaves and other vegetative organs to developing bolls. Potassium increases the photosynthetic rates of crop leaves, CO2 assimilation and facilitating carbon movement . At least sixty enzymes are known to be activated by this ion. The enzyme pyruvate kinas (more correctly referred to as ATP: pyruvate phosphotransferase), participates in glycolysis . The high concentration of K+ is thought to be essential for normal protein synthesis. Potassium role in this process is considered to be the maintenance of a proper association between t RNA molecules and ribosomes during the translation of mRNA . Potassium also acts as an activator for several enzymes involved in carbohydrates metabolism. The requirement of cotton for K increases with the beginning of bud formation stage. A greater accumulation of sugars and starch in leaves under K-deficient conditions adversely affects development of bolls due to deficiency of metabolites. K deficiency during the reproductive period can limit the accumulation of crop biomass , markedly change the structure of fruitbearing organs, and decrease yield and quality. Pettigrew  stated that the elevated carbohydrate concentrations remaining in source tissue, such as leaves, appear to be part of the overall effect of K deficiency in reducing the amount of photosynthate available for reproductive sinks and thereby producing the changes in yield and quality seen in cotton. Calcium (Ca): Ca is essential in cell nucleus matrix. It activates enzymes, particularly those that are membrane-bound . Calcium is important in membrane permeability, maintenance of cell integrity, and in ion uptake. Calcium deficiency may also decrease the basipetal transport of auxin . Addicot and Lyon  listed Ca deficiency as one of the causes of abscission and suggested this plus the role of Ca in the middle lamella (Ca pectates) as the possible reason. It is thought that Ca is important in the formation of cell membranes and lipid structures. Ma and Sun  suggested that Ca might be involved in light signal transduction chain for phototropism. Calcium also plays an important role in plant growth as a major component of the middle lamella (calcium pectate). A likely reason was that Ca deficiency affected translocation of carbohydrates, causing accumulation in the leaves and a decline in stems and roots. Zinc (Zn): Although only small amounts of Zn are removed from the field by a cotton crop (0.5 ounces per bale), Zn is critical for several key enzymes in the plant . Zinc influences electron transfer reactions, including those of the Kreb cycle, and thereby affecting the plant’s energy production. Zinc binds tightly to Zn-containing essential metabolites in vegetative tissues, e.g., Zn-activated enzymes such as carbonic anhydrase . Zn deficiency has been shown to affect growing sink organs; it adversely affects the development and viability of pollen grains . Zinc deficiency occurs on high-pH soils, particularly where topsoil has been removed in preparing fields for irrigation and thereby exposing the Zn-deficient subsoil. Also, Zn deficiencies have occurred where high rates of P are applied. The high P rates in the plant interfere with the utilization of Zn . Plant growth regulators retardants (PGR): PGR represent diverse chemistries and mode of action, and provide numerous possibilities for altering crop growth and development . PGR [e.g., 1, 1-dimethyl piperidinium chloride (MC); 2-chloroethyl trimethyl ammonium chloride (CC); or succinic acid 2, 2-dimethyl hydrazide (SADH)] provide farmers with a new management tool for controlling undesirable vegetative growth. An objective for using PGR in cotton is to balance vegetative and reproductive growth as well as to improve yield and its quality . Visual growth-regulating activity of MC, CC or SADH is similar [28,29], being expressed as reduced plant height and width (shortened stem and branch internodes and leaf petioles); it influence leaf chlorophyll concentration, structure and CO2 assimilation, and thicker leaves. In Egypt, soil fertilization is the primary limiting factor affecting growth and production under intensive land use for two or more crops per year. Furthermore, recently released varieties have high yielding ability, which largely depends on ensuring the plant’s essential nutritional requirements (e.g., N, P, K, Ca, Zn). Considerable interest also exists in using PGR for cotton production because of their potential for altering crop growth and seed development . All environmental factors and their interactions that influence plant growth can potentially influence the complicated and dynamic processes that control their seed initiation, development, and seed nutrient reserves. These factors can modify the ultimate vigor and viability of seeds . The objectives of this study were to evaluate the effects of N and P, and K fertilization and foliar application of chelated Ca and Zn nutrients, and the PGR (e.g., MC, CC or SADH) during square initiation and boll setting stage and to identify the best combination of these production treatments in order to improve seed yield, seed weight, and seed quality (as measured by seed viability, seedling vigor and cool germination test) of Egyptian cotton (G. barbadense). Table 1. Physical and chemical properties of the soil used in I and II seasons. AS, and the second one was 3 weeks later. Thereafter, the plots were irrigated every 2 weeks until the end of the season, thus providing a total of nine irrigations. In every experiment, fertilization along with pest and weed management was applied as needed during the growing season, according to local practices performed at the experimental station. 1) Two N rates (farmer rate of 107 kg·ha−1 N as control, and a higher rate of 161 kg·ha−1·N) applied as ammonium nitrate (MH4NO3, 33.5% N) in two equal doses, six and eight weeks AS. Table 2. Range and mean values of the weather variables recorded during the growing seasons (April-October). after sowing (DAS) (during square initiation and boll formation stages) at a rate of 300 ppm. The volume of solution used for each one was 960 l ha−1. Water alone (0 PGR) was foliar-sprayed at 960 liters ha−1 as the control or check treatment. 3) Two Zn rates (0 as control or 50 ppm Zn) in the chelated form (ethylene diamine tetra-acetic acid, EDTA) were applied. Each was foliar-sprayed two times, i.e. 80 and 95 DAS. The volume of solution used for each rate was 960 l ha−1 . 1) Two P rates (44 or 74 kg·ha−1 P2O5), were applied (banded into soil) as calcium super phosphate (15% P2O5) three weeks AS, just before the first irrigation. General Farmer practice of applying 44 kg·ha−1 P2O5 was used as the control treatment. 2) Two Zn rates (0 as control or 40 ppm Zn) were applied as the chelated form. Each rate was foliar-sprayed twice, at 75 and 90 DAS. Volume of solution applied was 960 l ha−1 (actual Zn applied in each spray was 0 or 38.4 g·ha−1)3) Four Ca rates (0 as control, 20, 40 or 60 ppm Ca) were applied as the chelated form. Each rate was foliarsprayed twice, at 80 and 95 DAS. Volume of solution applied was 960 l ha−1 (actual Ca applied in each spray was 0, 19.2, 38.4 or 57.6 g·ha−1) . Materials: A field experiment was conducted at the ARC in Giza, Egypt using the cotton cultivar Giza 86 in the two seasons I and II. The factors studied were N fertilization, foliar application of potassium, and the PGR MC. Two N rates, 95.2 and 142.8 kg·N·ha−1, were applied as ammonium nitrate at two equal doses, six and eight weeks AS. Each application in the form of side dressing beside each hill was followed immediately by irrigation. Four K rates (0, 0.38, 0.77, 1.15 kg·ha−1 K2O) were applied in a volume 960 l ha−1as K sulfate (K2SO4, “48% K2O”) twice during the reproductive phase. The first application occurre 70 DAS during square initiation and the second at 95 DAS during boll development. The foliar PGR MC was applied twice during reproductive phase, both times delivered in of 960 l H2O ha−1. The first application (0.048 kg a.i. ha−1) occurre 75 DAS and the second (0.024 kg a.i. ha−1) 90 DAS. Control plots received no MC. The K2O and MC were both applied to the leaves with uniform coverage using a knapsack sprayer . Materials: A field experiment was conducted at the ARC in Giza, Egypt using the cotton cultivar Giza 86 in the two seasons I and II. Each experiment included 16 treatments, which were the combinations of two K rates (0.0 and 47 kg·ha−1 K), two Zn rates (0.0 or 58 g·ha−1 Zn) (0 or 57.6 g of Zn ha−1) and four P rates (0.0, 576, 1152 and 1728 g·ha−1 P) (0, 576, 1152 and 1728 g·ha−1 P). The K was applied as K sulfate (K2SO4, “48% K2O”) eight weeks AS (as a band close to the seed ridge) and the application was followed immediately by irrigation. Zn was applied to the foliage in chelated form two times (70 and 85 DAS). Foliar application of P (calcium super phosphate, 15% P2O5) was made twice (80 and 95 DAS). The Zn and P were both applied to the leaves with uniform coverage at a solution volume of 960 l ha−1, using a knapsack sprayer . At harvest, bolls of 10 randomly chosen plants from each plot were harvested (handpicking) and laboratory-ginned to determine seed yield in g per plant. 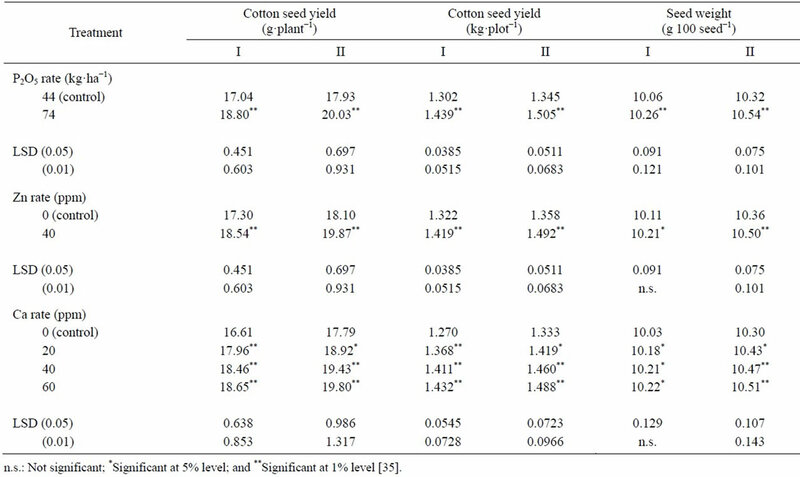 Total seed cotton yield of each plot (including the 10-plant sub-sample) was lab-ginned to determine seed yield in kg·ha−1. A random sample of 100 g of seeds from each plot was taken to determine seed weight (weight of 100 seed in g) and to evaluate seed quality in terms for seed viability, cool germination test performance, and seedling vigor . 1) First germination count (germination velocity): percentage of seeds that sprouted after four days of incubation. 2) Second germination count: percentage of seeds that sprouted after eight days of incubation. This count was used to calculate germination rate index. 3) Total germination capacity (final count): total percentage of normal seedlings after 12 days of incubation. where n = 3 is the number of times counts were taken . In this test, the germination chamber was maintained at a constant temperature of 18˚C ± 1˚C with sufficient humidity to prevent drying of the paper towel substratum . Two hundred seeds (four replicates of 50 seeds each) were tested per field treatment. Four paper towels represented each of the four replicates of each treatment. In each of the four replicates, the 50 seeds were randomly placed on moist towels, as usually practiced in the standard germination test. Two towels were placed over the seeds before rolling. The towels were moistened, but not so wet that by pressing, a film of water formed around the finger. Rolled towel tests were then set upright in wire mesh baskets in the germinator. Additional moisture was not needed during the test period. Two counts of germination were made for germination on the fourth and seventh day under test conditions . Aluminum dishes, similar to those described regarding the seed viability test, were used to evaluate seedling vigor. Two dishes represented each of the four replicates of each treatment; in each dish, 50 seeds were planted. Ten seedlings were randomly taken from each dish after eight days of incubation at 30˚C ± 1˚C to measure the following seedling vigor characters: (1) length (in cm) of hypocotyl, radicle and entire seedling; and (2) fresh and dry weights (g) of 10 seedlings. The 10 seedlings were weighed immediately to record fresh weight, and then oven-dried for 72 hours at 85˚C to determine dry weight . Data for the studied characters observed were analyzed as a factorial experiment arranged in a randomized complete block design, and combined statistical analysis for the two years had been done, according to Snedecor and Cochran . The Least Significant Difference (L.S.D.) test (t-test) at the 0.05 significance level was used to examine differences among treatment means . Table 3. Effect of N-rate and foliar application of plant growth retardants and Zn on seed yield plant−1 and seed yield ha−1, and seed weight. increases, while in II season, increases were significant with all tested PGR. The highest numerically increase in seed yield was with MC, followed in order by CC, and SADH. Such increases may be due to increased photosynthetic activity of leaves when these substances are applied. Increased photosynthesis greatly increased flowering, boll retention, and boll weight [44,45]. Abdel-Al  indicated that cotton yield significantly increased with MC treatment at a rate 11.90 ml (formulation) ha−1at the beginning of flowering. Pípolo et al. found that spraying cotton plants at an age of 70 d after emergence with CC at rates ranging from 25 to 100 g·ha−1 resulted in yield increases. Sawan and Gregg  stated that application of CC and SADH, at rates ranging from 250 to 700 ppm 105 DAS increased cotton seed yield ha−1. Similar results were obtained by Sarwar Cheema et al. . Zinc application significantly increased seed yield plant−1 and ha−1 in both years, as compared with untreated plants. Zinc is required in the synthesis of tryptophan, which is a precursor of IAA synthesis which is the hormone that inhibits abscission of squares and bolls. Also, this nutrient has favorable effect on the photosynthetic activity of leaves and plant metabolism , which might account for higher accumulation of metabolites in reproductive organs (bolls). Similar results were obtained by Basilious et al. , by foliar spraying of 0.314 kg·ha−1 Zn at flowering stage, Gomaa  when cotton was sprayed with 0.4 kg·ha−1 ZnSO4. Zeng  stated that application of Zn to cotton plants on calcareous soil increased yield by 7.8% - 25.7% and Ibrahim et al. . Seed weight: Seed weight significantly increased by adding the high N-rate in both years (Table 3). This may be partially due to enhanced photosynthetic activity . Similar findings were obtained by Palomo Gil and Chávez González . Application of PGR increased seed weight over the untreated control in both years. The increase was significant for MC and CC in season I. In season II, the increase was significant for all the three plant growth retardants. Spraying plants with MC produced the highest numerically seed weight. Increased seed weight as a result of MC, CC or SADH applications may be due to increase in photosynthetic activity, which stimulates photosynthetic activity and dry matter accumulation, and in turn increases formation of fully-mature seed and increases seed weight. These agree with previous works of Kler et al. when CC was applied at 58 ppm after 75 DAS, Sawan and Sakr  when MC was applied at 10-100 ppm once after 90 D or twice after 90 and 110 DAS, Sawan and Gregg  when CC or SADH was sprayed at 250, 500 or 750 ppm after 105 DAS. Results are confirmed by those of Carvalho et al. by applying MC and CC and Abdel-Al , by applying MC. Seed weight significantly increased with Zn application, compared with the control in both years. This may be due to its favorable effects on photosynthetic activity, improving mobilization of photosynthesis and directly affect seed weight. In this connection Ibrahim et al. noted that seed weight increased due to the application of Zn. Table 4. Effect of N-rate and foliar application of plant growth retardants and Zn on seed viability and cool germination test performance. Table 5. Effect of N-rate and foliar application of plant growth retardants and Zn on seedling vigor. manifested in metabolites formed in plant tissues, and directly influence growth and development processes. Favorable effects of Zn on seed viability and seedling vigor were mentioned by Sawan et al. when Zn was applied at 12.5 ppm three times as foliar spray after 70, 85 and 100 DAS. No information on residual effects of Zn on cool germination test performance was found. The interaction between N-rate and application of PGR or zinc showed no significant effect on the investigated characters. Table 6. Effect of P-rate and foliar application of Zn and Ca on seed yield plant−1 and seed yield plot−1, and seed weight. of photosynthesis and the translocation of carbohydrates to young bolls. Calcium deficiency depressed the rate of photosynthesis (rate of CO2 fixation). Guinn  stated that Ca deficiency would cause carbohydrates to accumulate in leaves and not in young bolls. The results obtained agree with those reported by Shui and Meng  and Wright et al. . Seed weight: Application of P at the high rate of 74 kg·ha−1 P2O5 and Zn at the concentration of 40 ppm, both significantly increased seed weight relative to the control in the two seasons (Table 6) . A possible explanation for increased seed weight due to the application of P at the higher rate is that this nutrient activated biological reactions in the cotton plants, particularly CO2 fixation and the synthesis of sugar, amino acids, protein, lipids and other organic compounds. It also increased the translocation of assimilates from photosynthetic organs to the sink . Similar results were obtained by ElDebaby et al. . Application of Zn significantly increased seed index, compared to the control. This may be due to its favorable effect on photosynthetic activity. Zinc improves mobilization of photosynthates and directly influences boll weight that coincide directly with increased seed index. These results are confirmed by those obtained by Ibrahim et al. . Calcium applied at all rates significantly increased seed index over the control. The highest rate of Ca (60 ppm) showed the highest numerical value of seed index. Similar results were obtained by Ibrahim et al. .
Table 7. Effect of P-rate and foliar application of Zn and Ca on seed viability and cool germination test performance. Table 8. Effect of P-rate and foliar application of Zn and Ca on seedling vigor. possible that macromolecular substrates such as starch might require Ca2+ for bridge complexes . Phosphorus-rates or application of Zn or Ca at different concentrations had no significant effect in either year on germination rate index. Plant growth and mineral contents: From Table 9, it follows that there were significant effects under the high N-rate regime (142.8 kg·ha−1 N) on growth and nutrient content of cotton plants (105 DAS) compared with the lower rate (95.2 kg·ha−1 N) . These findings coincide with the fact that N is an essential nutrient in building a plant dry matter as well as many energy-rich compounds (ATP), which regulate photosynthesis. Under N deficiency, a considerably larger proportion of dry matter (photosynthates) is partitioned to roots than shoots, leading to reduced shoot/root dry weight ratios . Shrivastava et al. found that an increase in N level (from 0 up to 120 kg·N·ha−1) application caused an increased uptake of N, P and K. Perumai  stated that when cotton was given 0-120 kg·N·ha−1, an increase in an N level (from 0 up to 120 kg·ha−1·N) significantly increased aboveground biomass production. Bronson et al. found that petiole NO3-N readings were positively related to N rate when applied up to 112 kg·N·ha−1. According to the N-status in our experimental soil (Table 1), it was classified as medium fertile for N. The K applied at all the three K concentrations (0.38, 0.77, 1.15 kg of K2O ha−1) significantly enhanced growth, N and K uptake of cotton plants as compared to control (0 kg·ha−1 K2O). In this connection, Fan et al. found that K content in petioles and total dry matter production in cotton increased by application of K. Gormus  indicated that the 0 kg·ha−1 K2O plots (untreated control) had lower leaf K concentrations compared with the plots with 80, 160 and 240 kg·ha−1 K2O. According to the K-status in our experimental soil (Table 1), it classified as medium fertile for K. MC significantly increased dry matter yield and N and K uptake of cotton plants compared with plots not treated with MC. Hodges et al. stated that application of MC increased canopy grass photosynthesis of cotton within 48 h, suggesting a direct effect of MC on photosynthesis. Zhao and Oosterhuis  stated that MC application improved leaf photosynthetic rate compared with the untreated control. Table 9. Mean effects of N-rate and foliar application of potassium and the plant growth MC on dry matter yield and uptake of N and K by cotton plants (season II, sampled 105 days after planting). Table 10. Mean effects of N-rate and foliar application of potassium and the plant growth retardant MC on seed yield plant−1 and seed yield ha−1, and seed weight. plants (Table 9) . These increases could be due to the favorable effects of this nutrient on yield components such as number of opened bolls plant−1, boll weight, or both, leading to higher cotton yield. Zeng  indicated that K fertilizer affects abscission and reduced boll shedding and it certainly affects yield. Pettigrew  stated that, the elevated carbohydrate concentrations remaining in source tissue, such as leaves, appear to be part of the overall effect of K deficiency in reducing the amount of photosynthate available for reproductive sinks and thereby producing changes in boll weight. Cakmak et al. found that, the K nutrition had pronounced effects on carbohydrate partitioning by affecting either the phloem export of photosynthates (sucrose) or growth rate of sink and/or source organs. Results obtained here confirmed those obtained by Aneela et al. when applying 200 kg K2O ha−1, Pervez et al. under 62.5, 125, 250 kg·K·ha·ha−1, and Pettigrew et al. under K fertilizer (112 kg·ha−1). MC significantly increased seed yield plant−1 (by 9.68%), and ha−1 (by 9.72%) compared with untreated plants. This could be attributed to the fact that MC significantly controlled new growth and N and K uptake of cotton plants compared to plots not treated with MC (Table 9) . Such increases could be due to the fact that, the application of MC restrict vegetative growth and thus enhance reproductive organs by allowing plants to direct more energy towards the reproductive structure . This means that bolls on treated cotton would have a larger photo synthetically supplied sink of carbohydrates and other metabolites than did those on untreated cotton . Results agreed with those obtained by Prakash et al. when MC was applied at 50 ppm, Mekki  when MC was applied at 100 ppm, and Kumar et al. . Also, similar results were obtained by Sarwar Cheema et al. . Seed weight: Seed weight significantly increased with an increase in N from 95.2 to 142.8 kg·ha−1 (Table 10). This may be due to increased photosynthetic activity, which increases accumulation of metabolites, with direct impact on seed weight (Table 9) . This may be due to increased photosynthetic activity that increases accumulation of metabolites, with direct impact on seed weight. Reddy et al. , in a pot experiment under natural environmental conditions, where 20-day old cotton plants received 0, 0.5, 1.5 or 6 mM NO3, found that, net photosynthetic rates, stomatal conductance and transpiration were positively correlated with leaf N concentration. Similar findings were reported by Palomo et al. , when N was applied at 40 - 200 kg·ha−1, and Ali and El-Sayed , when N was applied at 95 - 190 kg·ha−1. The K application, at all the three concentrations, increased seed weight compared with a control. Results from K application were more effective and significant when applied at the high concentration (1.15 kg·ha−1 K2O) than those produced from the low concentration (0.38 kg·ha−1 K2O). This may be due to its favorable effects on nutrient uptake, photosynthetic activity, improving its mobilization (Table 9) , which directly influences boll weight and increased seed weight . Ghourab et al. and Ibrahim et al. reported that, the application of K fertilizer MC significantly increased seed weight as compared to untreated control. Increased seed weight as a result of MC applications may be due to an increase in photosynthetic activity, which stimulates photosynthetic activity, and dry matter accumulation [89, 93], and in turn increases the formation of fully-mature seed and thus increases seed weight. Similar results to the present study were obtained by Ghourab et al. and Lamas . Table 11. Mean effects of N-rate and foliar application of potassium and the plant growth retardant MC on seed viability and cool germination test performance. Table 12. Mean effects of N-rate and foliar application of potassium and the plant growth retardant MC on seedling vigor. stated that seed density was positively associated with germination capability at 15˚C. Gadallah  indicated that viability, germination and seedling emergence were directly related to seed density for the G. barbadense cultivars. He pointed out that high seed density of all cultivars usually exhibited faster and more uniform rates of radicle emergence than low seed density. Seedlings from heavier seeds had greater accumulation of fresh and dry weight, and quality and vigor indices were also higher than those from light seeds. N is essential for plant protein synthesis including chlorophyll, which is indispensable for photosynthesis and enzymes which act as catalysts in biochemical reactions, and seed reserve proteins . Maiya et al. indicated that the largeand medium-sized seeds (>4.75 mm) recorded higher field emergence (>65%) and produced vigorous seedlings compared to smaller seeds (<4.75 mm). The shoot and root length of seedlings increased with an increase in seed size. Thus, heavier cottonseed has a higher growth potential than lighter seed. Potassium application has favorable effects as an activator of several enzymes involved in carbohydrate metabolism and on the metabolism of nucleic acids, proteins, vitamins and growth substances [12,93]. This may be reflected in distinct changes in seed weight and quality. Vasudevan et al. studied the response of sunflower to K, P, and Zn along with recommended doses of N, P and K, and found that those nutrients increased the seed-quality parameters such as higher germination after accelerated ageing, higher speed of germination, higher shoot and root lengths, higher vigor index and seedling-growth rate compared with the control. No information on residual effects of K on cool germination test performance was found in the available literature on cotton plants. Beneficial residual effects of MC on seed viability, seedling vigor and cool germination test performance may be due to their favorable effects on seed weight . Wang et al. stated that the application of MC (at 50 or 100 mg·kg−1) to the cotton plants at squaring decreased the partitioning of assimilates to the main stem, the branches and their growing points, and increased partitioning to the reproductive organs and roots. Also, they indicated that, from flower to boll setting, MC application was very effective in promoting the partitioning of assimilates into reproductive organs (seeds). Lamas and Athayde  indicated that seedling emergence and seedling dry matter increased with increasing MC rate, when applied at 50, 75, 100 or 125 g·ha−1. Significant effects for the main treatments and years were detected, on all studied characters, with one exception for the Germination rate index. Replications within years showed significant effects only on cotton seed yield plant−1 and ha−1, seed weight and first germination count. Boman and Westerman  found that no significant N × MC rate interactions on growth and yield of cotton when the plants received 0 to 227 kg·ha−1 N and were sprayed at early flowering with 0, 25 or 50 g·ha−1 MC. -between Zn and P for K and Zn uptake (Table 15). -between K, Zn and P for total chlorophyll concentration, as well as for Zn uptake (Table 16). Application of the high K rate combined with Zn and or P application increased dry matter yield of cotton plants (shoots) at 105 DAS, as well as total chlorophyll concentration and K, Zn and P uptake, over that obtained with the high K rate or Zn and or P alone. Table 13. Effect of interaction between K rate and foliar application of Zn on dry matter yield and uptake of K, Zn and P by cotton plants (season II, sampled 105 days after planting). Table 14. Effect of interaction between K rate and foliar application of P on chlorophyll and uptake of K and Zn and by cotton plants (season II, sampled 105 days after planting). Table 15. Effect of interaction between Zn rate and foliar application of P on uptake of K and Zn by cotton plants (season II, sampled 105 days after planting). Table 16. Effect of interactions between K rate, foliar application of Zn; P on chlorophyll and uptake of Zn by cotton plants (season II, sampled 105 days after planting). Table 17. Mean effects of K and foliar application of Zn and P on dry matter yield, chlorophyll and uptake of K, Zn and P by cotton plants (season II, sampled 105 days after planting). kg·ha−1) increased P uptake and content in stem, leaf, reproductive parts and seed. Ahmad et al. pointed out that P deficiency reduced biomass. Seed yield: Seed yield plant−1, as well as plot−1, significantly increased when K was applied (by as much as 14.72, 13.13; 14.69, 13.26%, respectively) in both seasons (Table 18) . K would have a favorable impact on yield components, including number of opened bolls plant−1 and boll weight, leading to a higher cotton yield. Guinn  suggested that growth, flowering, and boll retention decrease when the demand for photosynthate increases and exceeds the supply. The obtained results of total chlorophyll (a; b) confirmed these findings (Table 17) . This means that an increase in photosynthesis should permit more bolls to be set before cutout. Sangakkara et al. indicated that, K increases the photosynthetic rates of crop leaves, CO2 assimilation and facilitates carbon movement. Also, the role of K suggests that it affects abscission and reduced boll shedding and it certainly affects yield . Mullins et al. evaluated cotton yield in relation to long-term surface application of K at 49.8 - 149.4 kg·ha−1 and found that K application increased yield. Results obtained here were similar to those of Gormus , Aneela et al. , Pervez et al. , Pettigrew et al. , Sawan et al. [112,113] and Ibrahim et al. . 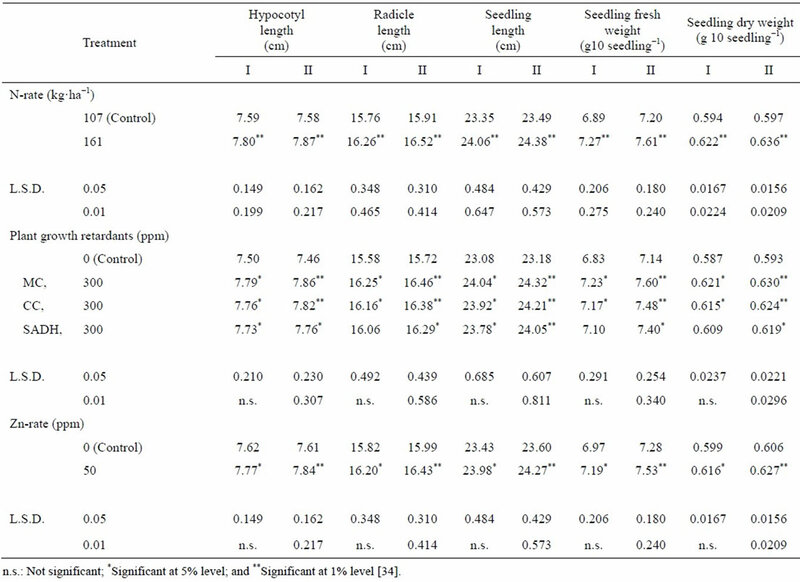 Application of Zn significantly increased seed yield plant−1, and seed yield plot−1, as compared with the untreated control (by 10.22, 8.81; 10.07, 8.70%, respectively) in the two seasons (Table 18) . 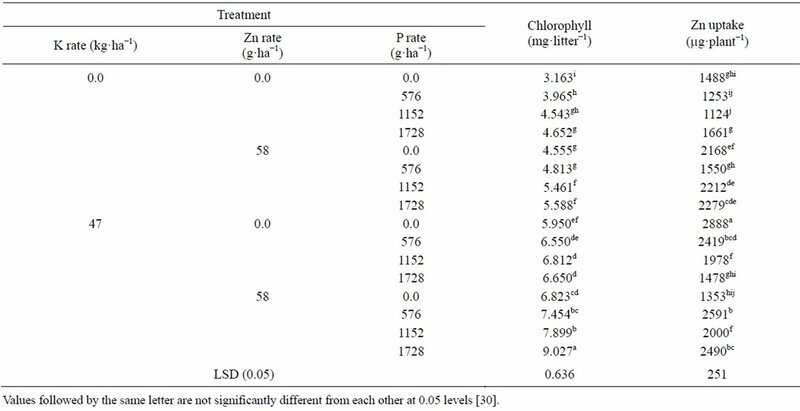 Zn could have a favorable effect on photosynthetic activity of leaves, which improves mobilization of photosynthesis coincidence the increases total chlorophyll (a; b) as shown in Table 17 and directly influences boll weight. Further, Zn is required in the synthesis of tryptophan, a precursor of indole-3-acetic acid, which is the major hormone inhibits abscission of squares and bolls. Thus the number of retained bolls plant−1 and consequently seed yield ha−1 would be increased . Similar results were obtained by Rathinavel et al. 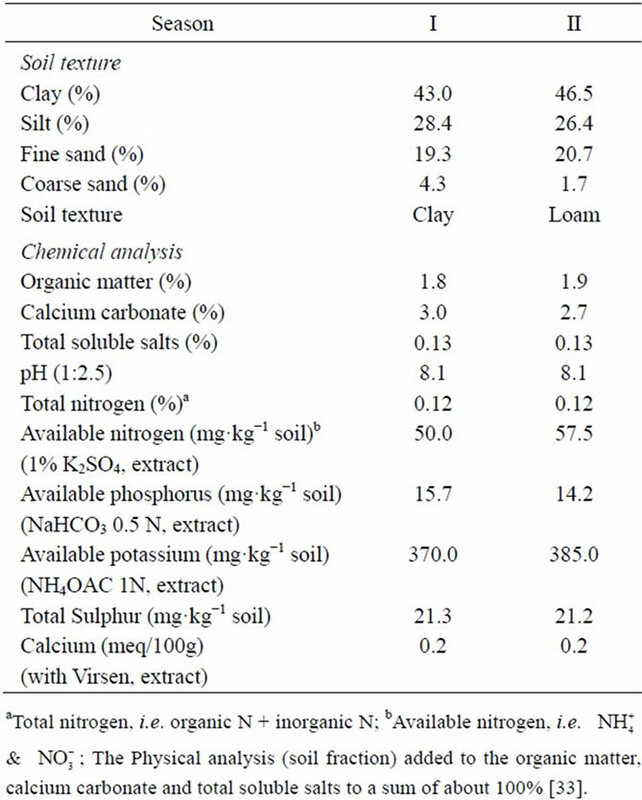 , by soil application of 50 kg·ha−1 ZnSO4, and Ibrahim et al. . Applying P significantly increased seed yield plant−1 and plot−1 in both seasons (Table 18), as compared to the untreated plants, when treatment rate was increased from 576 up to 1728 g·ha−1 (by 11.21 - 17.95, 8.31 - 16.39; 10.83 - 17.98, 8.03% - 16.20%, respectively). Generally seed yield plant−1 and plot−1 were the greatest when the highest P-concentration (1728 g·ha−1) was applied. Such results reflect the pronounced improvement of yield components due to application of P which is possibly ascribed to its involvement in photosynthesis and translocation of carbohydrates to young bolls . Phosphorus as a constituent of cell nucleus is essential for cell division and the development of meristematic tissue and hence it would have a stimulating effect on increasing the number of flowers and bolls plant−1 . These results agree with that reported by Katkar et al. , Ibrahim et al. and Saleem et al. .
Table 18. Effect of K-rate and foliar application of Zn and P on seed yield plant−1 and seed yield plot−1, and seed weight. produced the highest seed weight. This increased seed weight may be due to the fact that P activated the biological reaction in cotton plant, particularly photosynthesis fixation of CO2 and synthesis of sugar, and other organic compounds [2,80]. This indicates that treated cotton bolls had larger photosynthetically supplied sinks for carbohydrates and other metabolites than untreated bolls. 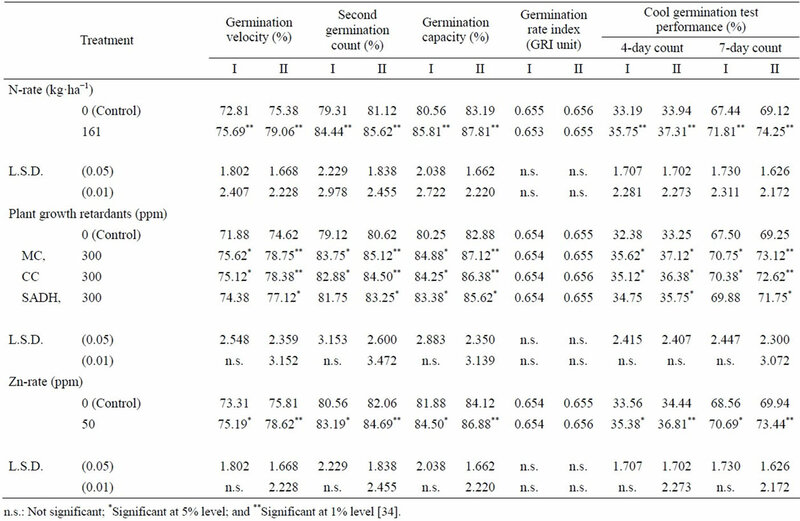 Seed viability, seedling vigor and cool germination test: Seed viability, cool germination test performance, and seedling vigor were significantly increased by application of K (47 kg·ha−1), Zn (58 g·ha−1) and P (576, 1152; 1728 g·ha−1), as compared with the untreated plants (Tables 19 and 20) . The differences between the effects of the three P rates were not significant, with the exception of the 1728 g·ha−1 dose, which significantly increased seed viability, seedling vigor and the cool germination test performance as compared with P applied at 576 g·ha−1. 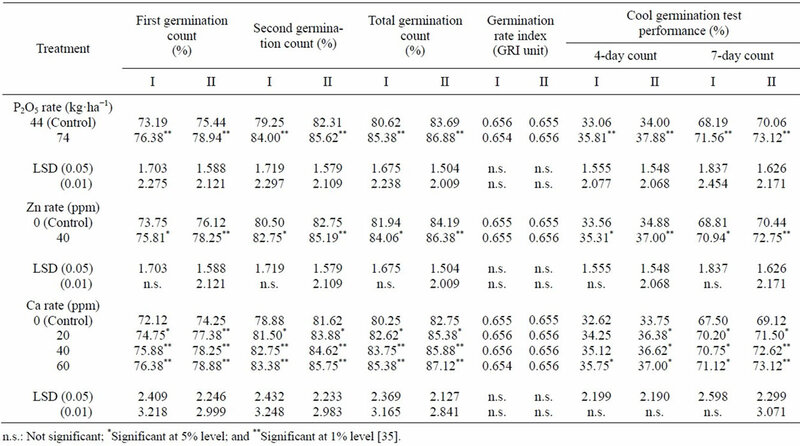 Application of K, Zn or P had no effect on germination rate index (GRI). Beneficial residual effects of K addition and application of Zn, and P at different concentrations on stimulating the seed viability, seedling vigor and cool germination test performance may be attributed to their favorable effects on increased seed weight associated with changes in the metabolism of nucleic acids, proteins, vitamins and growth substances [2,24,67,117]. At least sixty enzymes are known to be activated by this ion. The enzyme pyruvate kinas (more correctly referred to as ATP: pyruvate phosphotransferase), which participates in glycolysis . The high concentration of K+ is thought to be essential for normal protein synthesis. Potassium role in this process is considered to be the maintenance of a proper association between t RNA molecules and ribosomes during the translation of mRNA . Potassium also acts as an activator for several enzymes involved in carbohydrates metabolism. The requirement of cotton for K increases with the beginning of bud formation stage. A greater accumulation of sugars and starch in leaves under K-deficient conditions adversely affects development of bolls due to deficiency of metabolites. The significance of the correlation coefficients between seed weight and the various performance measures are as follows: 0.9487** - 0.9893** with seed viability, 0.8912** - 0.9437** with seedling vigor; 0.6660** - 0.9550** with cool germination test performance. Wang et al. studied the influence of physical characteristics of cotton seed on germination and emergence rates and found that germination rate and seed weight had an extreme positive correlation. Also found that seed weight had a positive correlation with emergence rate. From the findings of this study, it seems rational to recommend application of N at a rate of 161 of kg·ha−1, spraying of cotton plants with plant PGR, and application of Zn in comparison with the ordinary cultural practices adopted by Egyptian cotton producers. It is quite apparent that applications of such PGR, Zn, and increased N fertilization rates could bring about better impact on seed yield and seedling characters studied . Table 19. Effect of K-rate and foliar application of Zn and P on seed viability and cool germination test performance. Table 20. Effect of K-rate and foliar application of Zn and P on seedling vigor. be recommended to improve cotton seed yield, viability, and seedling vigor . Application of N at the rate of 142.8 kg·ha−1 and application of K (foliar, at the rate of 1.15 kg·ha−1 K2O) and MC (at the rate of 0.048 + 0.024 kg·ha−1 MC) should help achieve higher cotton seed productivity and quality (seed viability and seedling vigor) in comparison with the usual cultural practices adopted by Egyptian cotton procedures . From the findings of this study, the addition of K at 47 kg·ha−1, spraying cotton plants with Zn twice (at 57 g·ha−1), and also with P twice (especially the P concentration of 1728 g·ha−1) along with the soil fertilization used P at sowing time have been proven beneficial to the quality and yield of cotton plants. These combinations appeared to be the most effective treatments, affecting cottonseed productivity and quality (as indicated by better seed viability, seedling vigor, and cool germination test performance) . Albuquerque, M.C. de F. e and De Carvalho, N.M. (2003) Effect of the type of environmental stress on the emergence of sunflower (Helianthus annuus L.), soybean (Glycine max (L.) Merril) and maize (Zea mays L.) seeds with different levels of vigor. Seed Science and Technology, 31, 465-479. Welch, R.M. and Shuman, L. (1995) Micronutrient nutrition of plants. CRC Critical Reviews in Plant Science, 14, 49-82. Fenner, M. (1992) Environmental influences on seed size and composition. Horticultural Reviews, 13, 183-213. Borowski, E. (2001) The effect of nitrogenous compounds on the growth, photosynthesis and phosphorus uptake of sunflowers. Annales Universitatis Mariae Curie-Sklodowska. Sectio EEE, Horticultura, 9, 23-31. Silvertooth, J.C. and Norton, E.R. (1998) Evaluation of a feedback approach to nitrogen and Pix application. A College of Agriculture Report. Series P-112, University of Arizona, Tucson, 469-475. Hearn, A.B. (1981) Cotton nutrition. Field Crop Abstacts, 34, 11-34. Russell, E.W. (1973) Soil condition and plant growth. The English Language Book Society and Longman, London, 448. Bisson, P., Cretenet, M. and Jallas, E. (1994) Nitrogen, phosphorus and potassium availability in the soil-physicology of the assimilation and use of these nutrients by the plant. In: Constable, G.A. and Forrester, N.W., Eds., Challenging the Future: Proceedings of the World Cotton Research Conference-1, Brisbane, 14-17 February 1994, CSIRO, Melbourne, 115-124. Sasthri, G., Thiagarajan, C.P., Srimathi, P., Malarkodi, K. and Venkatasalam, E.P. (2001) Foliar application of nutrient on the seed yield and quality characters of nonaged and aged seeds of cotton cv. MCU5. Madras Agricultural Journal, 87, 202-206. Glass, A.D.M. (1989) Plant nutrition. An introduction to current concepts. Jones and Bartlett Publishers, Boston/ Portola Valley. Rensing, L. and Cornelius, G. (1980) Biological membranes as components of oscillating systems. Biologische Rundschau, 18, 197-209. Ma, L.G. and Sun, D.Y. (1997) The involvement of calcium in the light signal transduction chain for phototropism in sunflower seedling. Biologia Plantarum, 39, 569-574. Sharma, C.P., Sharma, P.N., Bisht, S.S. and Nautiyal, B.D. (1982) Zinc deficiency induced changes in cabbage. In: Scaife, A., Ed., Proceeding of the 9th Plant Nutrition Colloquy, Commonwealth Agricultural Bureaux, Farnham House, Slough, 601-606. Oosterhuis, D., Hake, K. and Burmester, C. (1991) Leaf feeding insects and mites. Cotton Physiology Today, 2, 1-7. Cothren, J.T. (1994) Use of growth regulators in cotton production. Challenging the future. In: Constable, G.A. and Forrester, N.W., Eds., Proceedings of the World Cotton Research Conference-1, CSIRO, Melbourne, 6-24. Zhao, D.L. and Oosterhuis, D.M. (2000) Pix Plus and mepiquat chloride effects on physiology, growth, and yield of field-grown cotton. Journal of Plant Growth Regulation, 19, 415-422.
von Heyendorff-Scheel, R.C., Schott, P.E. and Rittig F.R. (1983) Mepiquat chloride, a plant growth regulator for cotton. Zeitschrift fur Pflanzenkrankheiten und Pflanzenschutz, 90, 585-590. Chapman, H.D. and Pratt, P.F. (1961) Methods of analysis for soils, plants and waters. University of California, Los Angeles, 60-61, 150-179. Sawan, Z.M., Gregg, B.R. and Yousef, S.E. (1998) Influence of nitrogen fertilisation and foliar-applied plant growth retardants and zinc on cotton seed yield, viability and seedling vigour. Seed Science and Technology, 26, 393-404. Sawan, Z.M., Gregg, B.R. and Yousef, S.E. (1999) Effect of phosphorus, chelated zinc and calcium on cotton seed yield, viability and seedling vigour. Seed Science and Technology, 27, 329-337.
International Seed Testing Association (1976) International rules for seed testing. Seed Science and Technology, 4, 51- 177. Bartlett, M.S. (1937) Some examples of statistical methods of research in agriculture and applied biology. Supplement to the Journal of the Royal Statistical Society, 4, 137-183. Bird, L.S. and Reyes, A.A. (1967) Effects of cottonseed quality on seed and seedling characteristics. Proceedings Beltwide Cotton Conferences, 199-206. Snedecor, G.W. and Cochran, W.G. (1980) Statistical methods. 7th Edition, Iowa State University Press, Ames, 305. Abdel-Malak, K.I., Radwan, F.E. and Baslious, S.I. (1997) Effect of row width, hill spacing and nitrogen levels on seed cotton yield of Giza 83 cotton cultivar. Egyptian Journal of Agricultural Research, 75, 743-752. Palomo, G.A. and Chávez, G.J.F. (1997) Response of the early cotton cultivar CIAN 95 to nitrogen fertilizer application. ITEA. Producción Vegetal, 93, 126-132. Cheema, M.S., Akhtar, M. and Nasarullah, M. (2009) Effect of foliar application of mepiquat chloride under varying nitrogen levels on seed cotton yield and yield components. Journal of Agricultural Research, 47, 381-388. Saleem, M.F., Bilal, M.F., Awais, M., Shahid, M.Q. and Anjum, S.A. (2010) Effect of nitrogen on seed cotton yield and fiber quality of cotton (Gossypium hirsutum L.). Journal of Animal and Plant Sciences, 20, 23-27. Kler, D.S., Raj, D. and Dhillon, G.S. (1989) Modification of micro-environment with cotton canopy for reduced abscission and increased seed yield. Environment and Ecology, 7, 800-802. Abdel-Al, M.H. (1998) Response of Giza 85 cotton cultivar to the growth regulators Pix and Atonic. Egyptian Journal of Agricultural Research, 76, 1173-1181. Pípolo, A.E., Athayde, M.L.F., Pípolo, V.C. and Parducci, S. (1993) Comparison of different rates of chlorocholine chloride applied to herbaceous cotton. Pesquisa Agropecuária Brasileira, 28, 915-923. Sawan, Z.M. and Gregg, B.R. (1993) Influence of growth retardants and plant density on cotton yield and fiber properties. Ann. Bot. (Rome), LI, 33-42. Li, L.L., Ma, Z.B., Wang, W.L. and Tai, G.Q. (2004) Effect of spraying nitrogen and zinc at seedling stage on some physiological characteristics and yield of summer cotton. Journal of Henan Agricultural University, 38, 33-35. Gomaa, M.A. (1991) Response of cotton plant to phosphatic and zinc fertilization. Moshtohor, Annals of Agricultural Science, 29, 1051-1061. Zeng, Q.F. (1996) Experimental study on the efficiency of K fertilizer applied to cotton in areas with cinnamon soil or aquic soil. China Cottons, 23, 12. Ibrahim, M.E., Bekheta, M.A., El-Moursi, A. and Gaafar, N.A. (2009) Effect of arginine, prohexadione-Ca, some macro and micro-nutrients on growth, yield and fiber quality of cotton plants. World Journal of Agricultural Sciences, 5, 863-870. Sawan, Z.M., Maddah El-Din, M.S. and Gregg, B. (1989) Effect of nitrogen fertilisation and foliar application of calcium and micro-elements on cotton seed yield, viability and seedling vigor. Seed Science and Technology, 17, 421-431. Sawan, Z.M., Basyony, A.E., McCuistion, W.L. and ElFarra, A.A. (1993) Effect of plant population densities and application of growth retardants on cottonseed yield and quality. Journal of the American Oil Chemists’ Society, 70, 313-317. Vlasynk, P.A., Zhidkov, V.A., Ivchenkov, V.I., Kibalenko, A.P., Klimovitskaya, Z.M., Okrim, M.F. and Rudakova, E.V. (1978) Trace elements in nutrient metabolism and productivity of plants. Fiziologia Biokimya Kul’turnykh Rastenii, 10, 350-359. Guinn, G. (1984) Boll abscission in cotton. In: Gupta, U.S., Ed., Crop Physiology: Advancing Frontiers, Mohan Primlani for Oxford & IBH Publishing Co., New Delhi, 177-225. Saleem, M.F., Shakeel, A., Bilal, M.F., Shahid, M.Q. and Anjum, S.A. (2010) Effect of different phosphorus levels on earliness and yield of cotton cultivars. Soil and Environment, 29, 128-135. Alikhanova, O.I. and Tursunov, D. (1988) Efficiency of trace element fertilizers applied to cotton on reclaimed grey-brown stony soils in the Khodzha-Bakirgan massif. Agrokhimiya, 2, 72-77. Shui, J.G. and Meng, S.F. (1990) Effects of lime application on cotton yield in red soil fields. China Cottons, 26- 29. Wright, S.D., Munk, D., Munier, D., Vargas, R., Weir, B., Roberts, B. and Jimenez Jr., M. (1995) Effect of aminofol/Boll-Set Plus calcium zinc on California cotton. Proceedings of Beltwide Cotton Conferences, 2, 1374-1376. Kosheleva, L.L., Bakhnova, K.V., Semenova, T.A. and Mil’Kevich, Zh.A. (1984) Effect of phosphorus nutrition on metabolism of young fiber flax plants in relation to assimilate distribution in them. Referativnyi Zhurnal, 6, 533. El-Debaby, A.S., Hammam, G.Y. and Nagib, M.A. (1995) Effect of planting date, N and P application levels on seed index, lint percentage and technological characters of Giza 80 cotton cultivar. Moshtohor, Annals of Agricultural Science, 33, 455-464. Taiz, L. and Zeiger, E. (1991) Plant physiology: Mineral nutrition. The Benjamin Cummings Publishing Co., Redwood City, 100-119. Ochiai, E.L. (1977) Bioinorganic chemistry. Allyn & Bacon, Boston, 515. Engels, C. and Marschner, H. (1995) Plant uptake and utilization of nitrogen. In: Bacan, P.E., Ed., Nitrogen Fertilization in the Environment, Marcel Dekker, Inc., New York, 41-81. Shrivastava, U.K., Tomar, S.P.S. and Singh, D. (1993) Effect of N and Zn fertilization on uptake of nutrients and dry matter production. J. Indian Soc. Cotton Improv., 18, 71-74. Perumai, N.K. (1999) Effect of different nitrogen levels on morpho-physiological characters and yield in rainfed cotton. Indian Journal of Plant Physiology, 4, 65-67. Fan, S., Yuzhang, X. and Chaojun, Z. (1999) Effects of nitrogen, phosphorus and potassium on the development of cotton bolls in summer. Acta Gossypii Sinica, 11, 24- 30. Zhao, D.L. and Oosterhuis, D. (1999) Physiological, growth and yield responses of cotton to MepPlus and Mepiquat chloride. Proceedings of Beltwide Cotton Conferences, 1, 599-602. Wiatrak, P.J., Wright, D.L. and Marois, J.J. (2006) Development and yields of cotton under two tillage systems and nitrogen application following white lupine grain crop. Journal of Cotton Science, 10, 1-8. Wang, Z.L., Yin, Y.P. and Sun, X.Z. (1995) The effect of DPC (N, N-dimethyl piperidinium chloride) on the 14CO2- assimilation and partitioning of 14C assimilates within the cotton plants interplanted in a wheat stand. Photosynthetica, 31, 197-202. Ram, P., Mangal, P. and Pachauri, D.K. (2001) Effect of nitrogen, chlormequat chloride and FYM on growth yield and quality of cotton (Gossypium hirsutum L.). Annals of Agricultural Research, 22, 107-110. Mekki, B.B. (1999) Effect of mepiquat chloride on growth, yield and fiber properties of some Egyptian cotton cultivars. Arab Universities Journal of Agricultural Science, 7, 455- 466. Kumar, K.A.K., Patil, B.C. and Chetti, M.B. (2004) Effect of plant growth regulators on biophysical, biochemical parameters and yield of hybrid cotton. Karnataka Journal of Agricultural Science, 16, 591-594. Palomo, G.A., Godoy, A.S. and Chávez, G.J.F. (1999) Reductions in nitrogen fertilizers use with new cotton cultivars: Yield, yield components and fiber quality. Agrociencia, 33, 451-455. Ali, S.A. and El-Sayed, A.E. 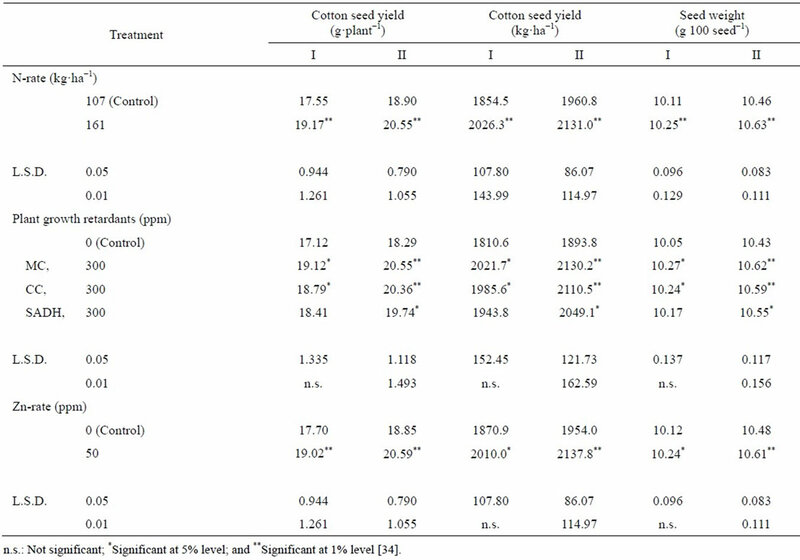 (2001) Effect of sowing dates and nitrogen levels on growth, earliness and yield of Egyptian cotton cultivar Giza 88. Egyptian Journal of Agricultural Research, 79, 221-232. Ghourab, M.H.H., Wassel, O.M.M. and Raya, N.A.A. (2000) Response of cotton plants to foliar application of (Pottasin-P)TM under two levels of nitrogen fertilizer. Egyptian Journal of Agricultural Research, 78, 781-793. Speed, T.R., Krieg, D.R. and Jividen, G. (1996) Relationship between cotton seedling cold tolerance and physical and chemical properties. Proceedings of Beltwide Cotton Conferences, 2, 1170-1171. Gadallah, F.M. 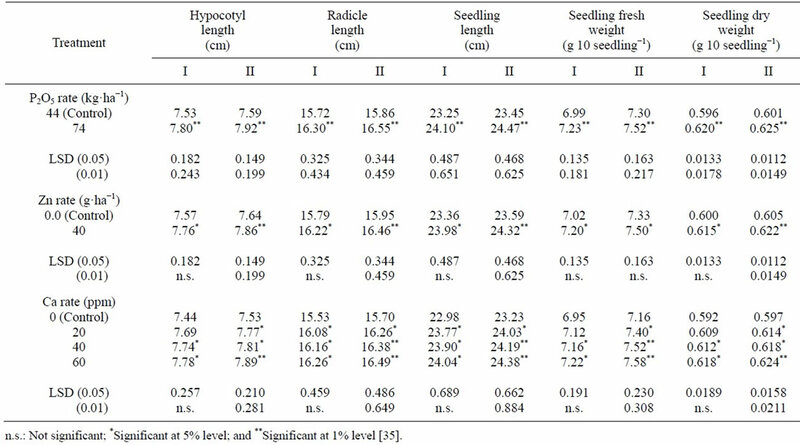 (2000) Seed density in relation to germination and seedling quality in cotton (Gossypium barbadense L.). Alexandria Journal of Agricultural Research, 45, 119-137. Maiya, M.R., Basave Gowda, Gouda, M.S. and Khadi, B.M. (2001) Effect of size grading on recovery and quality in naturally coloured cotton. Seed Research, 29, 248- 250. Vasudevan, S.N., Virupakshappa, K., Venugopal, N. and Bhaskar, S. (1997) Response of sunflower (Helianthus annuus) to phosphorus, sulphur, micronutrients and humic acid under irrigated conditions on red sandy-loam soil. Indian Journal of Agricultural Science, 67, 110-112. Hiremath, G.M. and Hunsigi, G. (1995) Effect of nitrogen and potash levels on concentration of nitrogen and potassium in petiole of two cotton hybrids (Gossypium sp.). Karnataka Journal of Agricultural Science, 8, 99-101. Benton, J.J., Wolf, B. and Mills, H.A. (1991) Plant analysis handbook. Micro-Macro Pub., Georgia. Ambrose, E.J. and Easty, D.M. (1977) Cell biology. The English Language Book Society and Longman, London. Mahmoud, M.H., Abdel Aziz, I. and Ashoub, M.A. (1985) The relationship between phosphorous and zinc and cotton plant. Annals Agricultural Science, 30, 1011-1030. Amberger, A. (1974) Micronutrients, dynamics in the soil and function in plant metabolism. I. Iron. Proc. Egypt. Bot Soc Workshop, 1, 81-90. More, S.D. and Agale, B.N. (1993) Phosphate balance studies in irrigated cotton. Journal of the Indian Society of Soil Science, 41, 498-500. Deshpande, R.M. and Lakhdive, B.A. (1994) Effect of plant growth substances and phosphorus levels on yield and phosphorus uptake by cotton. PKV Research Journal, 18, 118-121. Ahmad, Z., Gill, M.A., Qureshi, R.H., Aslam, M., Iqbal, J. and Nawas, S. (2000) Inter-cultivar variations of phosphorus-deficiency stress tolerance in cotton. Tropical Agricultural Research, 12, 119-127. Sawan, Z.M., Mahmoud, M.H. and El-Guibali, A.H. (2006) Response of yield, yield components, and fiber properties of Egyptian cotton (Gossypium barbadense L.) to nitrogen fertilization and foliar-applied potassium and mepiquat chloride. Journal of Cotton Science, 10, 224- 234. Sawan, Z.M., Hafez, S.A., Basyony, A.E. and Alkassas, A.R. (2007) Nitrogen, potassium and plant growth retardant effects on oil content and quality of cotton seed. Grasas Y Aceites, 58, 243-251. Rathinavel, K., Dharmalingam, C. and Paneerselvam, S. (2000) Effect of micronutrient on the productivity and quality of cotton seed cv. TCB 209 (Gossypium barbadense L.). Madras Agricultural Journal, 86, 313-316. Katkar, R.N., Turkhede, A.B., Solanke, V.M., Wankhade, S.T. and Sakhare, B.A. (2002) Effect of foliar sprays of n utrients and chemicals on yield and quality of cotton under rainfed condition. Res. Crops, 3, 27-29. Sabino, N.P., Da Silva, N.M. and Kondo, J.I. (1999) Components of production and fiber quality of cotton as a function of potassium and gypsum. Empresa Brasileira de Pesquisa Agropecuáia, Embrapa Algodão, Campina Grande, 703-706. Wang, Y.Q., Yang, W.H., Zhou, D.Y. and Xu, H.X. (2003) Study on the relationship between the nutrients of cottonseed and germination and emergence percentage. Cotton Science, 15, 109-112.